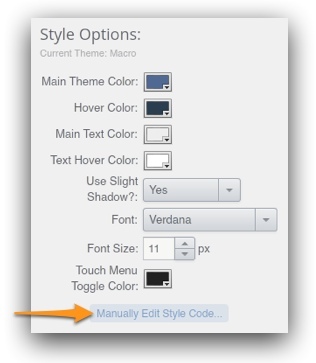 If you're an advanced user and are comfortable with editing CSS (or SCSS), you can make advanced customizations to a menu's CSS code. 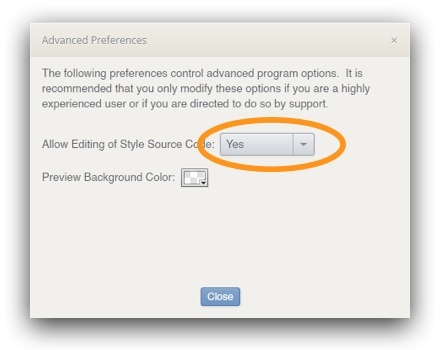 This allows for modifications beyond the options offered in the Styles Panel, such as specifying non-standard fonts. Please note that accidentally making errors while editing the CSS can cause a menu's styles to become corrupted, sometimes requiring the theme to be reset. It's recommended that you only edit the CSS if you're familar with making code modifications. If you accidentally introduce any errors, a warning will be shown when you close the source editing window. In this case, re-enter the code view and correct any mistakes. Note that custom fonts may not always appear correctly until you preview the entire page in a browser. They can be changed in the same manner.